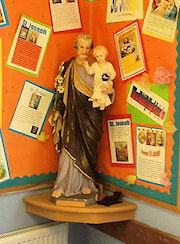 Saint Joseph is the patron saint of our school, and our role model in all that we do. Saint Joseph was chosen by God to help Mary to raise Jesus. The Bible tells us that Joseph was a 'just man', meaning that he was good and fair. He was a carpenter and worked hard at his job. Saint Joseph is the patron saint of many things. We can ask Saint Joseph to help us when we are feeling worried or confused about things. People usually pray to Saint Joseph for help for the poor, for the support and protection of fathers and families and even for help with work. Joseph is the patron saint of all working people. 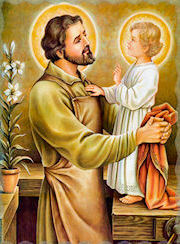 He is seen as a role model for fathers, and so Saint Joseph is known as a protector of families. 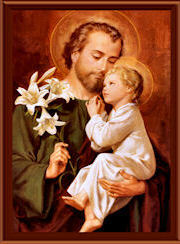 In 1870, Saint Joseph was also declared the Patron Saint of the Universal Church. Children in all classes are split into four house groups. Our House Groups are named after the Patron Saints of our multi academy trust schools. The House groups meet on a regular basis to engage in all sorts of enriching activities.